America's Home Expert, Danny Lipford, is making backyard paradise dreams come true as he kicks off his annual "Backyard Paradise" contest sponsored by Today's Homeowner Media and Pavestone. 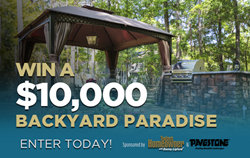 Win a $10,000 Backyard Paradise makeover from Today's Homeowner Media & Pavestone! People are looking at their backyards as an extension of their homes, and the industry has responded by creating stylish, comfortable and affordable products that help homeowners easily bring the indoors out. The backyard paradise of your dreams could be just a click away thanks to Today’s Homeowner and Pavestone! The two home improvement brands are partnering once again for a national “Backyard Paradise” contest, which begins today. This annual contest is very popular with Today’s Homeowner fans, and draws thousands of entrants from across the U.S. A 2018 survey from LightStream indicates rising popularity for outdoor living projects. In fact, the survey reports that 43 percent of homeowners are planning to improve their outdoor spaces, with deck, patio and landscaping projects rising to the top of the list. Continued interest in outdoor living doesn’t surprise Home Improvement Expert and host of “Today’s Homeowner” TV, Danny Lipford. The “Backyard Paradise” contest kicks off today and runs through April 14, 2019. The contest is open to legal residents of the U.S. who are at least 21 years of age and current homeowners. Contestants may enter the contest online at https://www.todayshomeowner.com/contest. Entries should be submitted with a 100-word or less summary of why the backyard needs a makeover, desired improvements, and a description of how an upgraded space would be used. Submission of videos and photos are highly encouraged. Lexington couple, Walt and Beth Arnett, won the 2018 Backyard Paradise contest. They submitted a funny video appealing to show hosts, Danny Lipford and Chelsea Lipford Wolf, to rescue them from their boring, broken-down backyard. The “Today’s Homeowner” TV episode featuring the Arnetts and their backyard makeover is available on TodaysHomeowner.com. Today's Homeowner is a trusted home improvement authority delivering fresh, original, practical advice to consumers across diverse media platforms including the top-rated, nationally syndicated “Today’s Homeowner” television show, now in its 21st season, and its radio counterpart, the nationally syndicated “Today’s Homeowner” radio show. Founded in 1980, Pavestone® is a leading manufacturer and supplier of concrete pavers, retaining walls, fire pits and other hardscapes for outdoor living. With manufacturing facilities across the country, Pavestone® is a design resource for landscape architects and contractors as well as homeowners. Part of The QUIKRETE® Companies’ hardscapes division, Pavestone® fulfills its brand promise for “Creating Beautiful Landscapes® every day. For more information about Pavestone® visit pavestone.com.